Music & My Mind: Le Fantôme de l'Opéra – quel ennui! Le Fantôme de l'Opéra – quel ennui! Most people are aware of the existence of an Andrew Lloyd Webber-composed musical phenomenon called The Phantom of the Opera, and will even recognize the first five notes of the overture. However, few will know that this famous spectacle is based on a little French novel written by Gaston Leroux, published in 1910. I had been familiar with the musical version for quite some time before I took up the novel – the original French edition, to keep up my skills – so naturally, I had some expectations and was interested to see how the stage adaptation compared to its original source. I hate to say this, but I was incredibly bored most of the time with this book. The 300+ pages seemed to never come to an end, and that wasn't just because French is a little harder for me to read than English or Finnish. I think part of the problem was that, knowing the musical, I knew most of what was going to happen beforehand and so the narration lost part of its suspense. 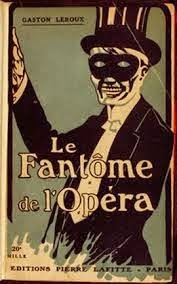 The setting is, naturally, an opera house in late 19th century Paris, and among the workers and performers the rumours of a mysterious and terrifying "Phantom" figure persist, despite the new managers' efforts to wave it all off as a somewhat annoying product of the collective imagination. Meanwhile, the young and gifted soprano Christine Daaé believes she is taking singing lessons from an "angel of music" sent by her deceased father. However, she finds out that her angel is actually a man, Erik, who suffers from a hideous facial disfigurement and a desperate love for Christine, both of which the ingénue finds quite alarming. Raoul de Chagny, a childhood friend who now wants her love, tries to rescue poor Christine from the frightening mess Erik has made. It's really a shame that Erik, although he is the titular "Phantom", doesn't get a proper appearance till about halfway through the book – the other two main characters we are given are terribly annoying in my humble opinion. Alright, Christine is very naïve in the musical adaptation too – even the most faithful fans find it more than a bit amusing how easily she follows a mask-wearing mystery man who suddenly appears through her dressing-room mirror – but in this book, she exasperated me more than ever. It seems that she is always pale and trembling and speaks almost exclusively in frightened whispers. Then she thwarts Raoul when he for once does some actual, rational thinking and suggests that they run the heck out of Erik's reach as soon as possible. This is a remarkable effort from Raoul, who isn't much in the habit of being rational in general. When he is not pining after Christine with every brain cell he possesses, he is being fiercely jealous of her and Erik. If he isn't by some chance doing either of these, he is probably bursting into tears for one reason or another. Then there is a most enigmatic character who is simply called "the Persian". He does not appear in the musical version at all, but in the book he is very important. Like Erik, he doesn't make an appearance till halfway through the book, but then he practically takes over the narration almost till the very end. Also, Raoul would have gotten absolutely nowhere in his attempt to rescue Christine from the Phantom's hideaway if the Persian hadn't offered to help. The Persian seems to share the Phantom's knowledge of the Opera house's catacombs as well as a part of his eventful history. Also, it's him who has to find a way out of the trap that Erik sets them; Raoul has a complete mental breakdown and thinks he's in a forest in Congo when Bad Phantom plays a mirror trick on him. The Persian was a welcome addition to the cast of characters because he was smart and not annoying, unlike most of the other main characters, but I couldn't help but feel that he seemed perhaps a little out of place underneath a Parisian opera house. His connection to Erik is mostly explained, but I still questioned his motives in constantly tailing the man! 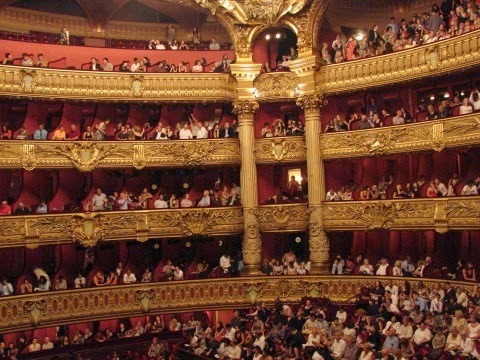 Another thing that works very well in Le Fantôme is setting the atmosphere of the great opera house. Whether it was about the hustle and bustle backstage during a performance, or the gathering of gossiping chorus girls, or the maze of underground passages and trapdoors, I felt like I was genuinely there. Gaston Leroux chose a great location for his story and describes it exquisitely, but unfortunately it doesn't entirely make up for the one great problem that I had with this book and which made it incredibly heavy to read. The real Paris Opera house, just to set the mood! But... hang on, we are still only a couple of pages over the middle of this book! Is Leroux seriously suggesting that the entire second half is going to be about Raoul looking for Christine? Apparently... yes. If the reader is supposed to be greatly interested in how the Persian babysits a mentally declining Raoul through the underground passages and how they bump into a completely random rat catcher before dropping into Erik's psychedelic mirror room where they sit for three chapters – well, it certainly didn't do the trick for me. For a non-native speaker who wants to try out a novel in French, Le Fantôme de l'Opéra looks relatively non-threatening with its little more than 300 pages and relatively standard use of the language – the only part where I got a little lost was the detailed descriptions of the trapdoor system under the Opera house, which kind of reminded me of Victor Hugo's devotion to Parisian sewers in Les Misérables. However, depending on how much you take issue with pacing and the character of Raoul de Chagny, you might be in for a longer journey of reading than you expected, wishing you had your own random Persian to take you through it. Always glad to entertain! Fortunately, even a not-so-likeable book is always great fun to review.